AT ERSTFELD STATION on the St. Gothard main line, with the snow-mantled pyramid of the Bristenstock in the background. The express is about to begin the lengthy climb up the Reuss Valley which, with the aid of spiral tunnels and the double loop at Wassen, lifts the line to Göschenen, 3,640 ft above sea-level, at the mouth of the St. Gothard Tunnel. This was the first Swiss main line to be electrified. IT is sometimes claimed by those who discuss the electrification of railways that if electricity for railway operation can be generated from water-power, then, in a country where water-power is abundant, its cost to the user must be negligible. Such an argument leaves many essential facts out of account. During the summer of 1935 the present writer was conducted by Swiss engineers up a remote mountain gorge, to the south of the Rhone Valley, to see work in progress on a barrage scheme. The scheme was designed to impound a large volume of water as a constant source of supply for the turbines in a new power-station which had just been completed at Sion. The expedition made a vivid impression of the enormous initial cost of carrying out an undertaking of this description. The interest on the capital cost forms a permanent “overhead charge” on all the power-station output, apart from the ordinary expenses of running the station. Switzerland has electrified her railways on a far more extensive scale than any other country, so that well over ninety per cent of her railway traffic is now electrically worked. So far as concerns the Swiss Federal Railways, indeed, only a few minor branch lines remain on which steam locomotives may still be found in service. But this wholesale electrification is not being confined to the railways. The aim of the Swiss Confederation is that before long the whole of the industries and ninety-eight per cent of the population - that is, all but those living in the most remote and high-lying mountain valleys - shall be provided with electricity. Switzerland has no indigenous coal. This fact was brought home to her with unpleasant force towards the close of the war of 1914-1918, when export of coal from Germany and France ceased entirely, thus cutting off Swiss supplies. The timber of her beautiful Alpine forests then became the only source of heat readily available to Switzerland. This forced to the fore the question of electrification. Much electrification of industries had already been carried out, but none on the main railway lines, and an immediate start on railway electrification was approved. But the work was thus begun when the prices of all the necessary materials and equipment were at their highest. While Switzerland is unfortunate in having no coal at her command, she is, on the other hand, fortunate in the possession of her immeasurable supplies of “white coal” - that is, of water-power. In a country such as this, with a large area of its surface covered by vast mountains whose summits are perpetually mantled with snow and ice, during most of the year there is constant melting in progress at high altitudes. The water thus produced rushes incessantly down the steeply inclined mountain valleys and gorges to find lower levels. It is this rushing water which is being trapped at various strategic points, and made to perform the service of producing electric power. But provision must be made for midwinter, when, in consequence of low temperatures, much, and at times all, of the flow is arrested. In general, the variations of flow of the mountain torrents, according to the time of year, the day and night temperatures, and the prevalence of rain or drought, must be allowed for by the construction of reservoirs from which a constant flow may be obtained throughout the year. These reservoirs are obtained by closing the mountain valleys, at suitable points, with the aid of vast dams or barrage’s, and so impounding a water supply sufficiently large to provide a regular flow of water at all times. CROSSING KERSTELENBACH VIADUCT, 182 ft above the level of the stream, on the St. Gothard route, near Amsteg, This was the first of the Swiss main lines to be electrified, and it is one of the busiest routes in the country. The express here illustrated is climbing the gradient, 18 miles in length, which reaches its summit level at Göschenen, 3,640ft above sea-level. Enormous sums of money have been expended, and still are being expended, on these great barrage schemes, as well as on the equipment of the power-stations in which is utilized the power of the regular flow of water thus stored. On a typical summer’s day the working of the Swiss Railway alone requires the consumption of roughly a million kilowatt-hours of current, the peak load at any given moment reaching a maximum of 76,000 kilowatts. In winter this demand may be swollen by 8 to 15 per cent, according to temperature, to supply sufficient heat in the passenger coaches. The power-station to which reference is made on the second paragraph of this page is known as the Chandoline power-station at Sion. It draws its water-supply from the remote mountain valley of Dixence, which is reached by following the Val d’Hérens southwards from Sion, and then forking south-westwards into the Val d’Hérémence, of which the Val des Dix is the upper end. 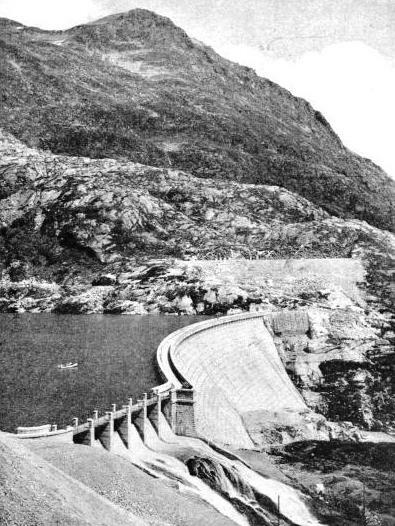 Here, at an altitude of 7,350 ft above sea-level, the new barrage imprisons an artificial lake three and a quarter miles in length, containing fifty million cubic metres (sixty-five million cubic yards) of water, of which the inner end all but reaches to the tips of the glaciers of Seilon and Lendarey. 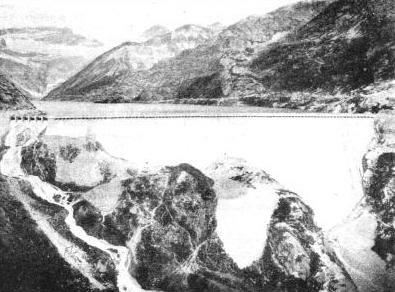 Preliminary work in connexion with the construction of the dam included the erection of three independent telpher or suspension railways (télépheriques); a road of awe-inspiring description, built for much of its length at an immense height up the mountain-side, from Sion up to the barrage works; and a funicular railway, having the dizzy inclination of 108 per cent, or one in seven-eighths, from the upper end of the road to the barrage itself. The whole of a mountain-side was blasted away to produce stone for the construction of the dam, and one of the telpher railways carried the stone straight across the intervening valley to the works at the barrage. The longest of the telpher lines came right up the Hérens and Hérémence Valleys from Sion - a total distance of ten and three-quarter miles as the crow flies, and considerably more by the route followed. A difference in level of 5,610 ft had to be negotiated. The telpher railways were required for the haulage of the large supplies of cement and other materials. The road and the funicular were constructed to bring up the machinery and other heavy material to the site. In addition, miles of railways were built in the neighbourhood of the barrage to bring to the works the thousands of tons of ballast needed for the making of the concrete. Five other telpher railways of smaller dimensions were erected up the mountains at various points between the barrage and Sion, to serve the workings in connexion with the tunnel which carries the water from the new lake to the Rhone Valley above the power-station. Another funicular ran directly up the side of the Rhone Valley from the power-station to carry into position the components of the pipe-line to which reference will be made in a moment. To complete this huge scale of preparations there was built on a mountain ledge adjacent to the dam a village of comfortable huts for the army of technicians, engineers, and workmen engaged, with a church, a canteen, and a mess. Now that the dam is complete, its dimensions need to be set on record. At its apex, this great wall, which contains roughly 523,000 cubic yards of concrete, covered externally with massive blocks of gneiss, is 1,475 ft across from one mountain wall to the other. At its base. this great barrage is 230 ft thick: at its maximum, the wall is 280 ft high. As is customary, the barrage wall is concave in plan being built in the form of an arc of a circle. When the lake is filled to the maximum height which the water will be permitted to reach, the level of its surface will be 7,350 ft above sea-level. The intake is at 7,150 ft above the sea, and in this 200 ft of height are comprised the sixty-five million cubic yards of water that the lake contains. Including the quantity in the bed of the lake, below the intake, the total capacity is over seventy million cubic yards. The water has now to be conducted from the Dixence Lake to the power-station, over ten miles away on the floor of the Rhone Valley. A tunnel, seven and a half miles long, has, therefore, been driven through the mountains bordering the Hérémence Valley. For all but the final quarter-mile the tunnel, driven through rock, is lined with concrete, reinforced with steel where necessary through certain strata. It has a diameter of 7 ft 4½ in, and a fall of 1 in 500, which, with the pressure of the body of water in the lake behind it, is sufficient to ensure a flow of thirteen and a quarter cubic yards of water every second. The last quarter-mile of the tunnel falls more steeply, at 1 in 100, and consists of a steel conduit, of 6 ft 6¾ in internal diameter, laid through a gallery which has been hollowed out of the mountainside to receive it. The conduit emerges high up on the south wall of the Rhone Valley. Far below, just to the south of the town of Sion, lies the power-station. Connecting the two is the great pipe-line, 17,970 ft - over three miles - in length. The difference in level between the valves giving admission to the pipes and the power-station below is no less than 5,440 ft. The total “head” of water, from the surface of the Lake of Dixence into the power-station, is 5,740 ft, of which all but 300 ft thus comes directly down the steep mountain-side into the power-house. For height of fall this is easily a world’s record, and the vast amount of power thus brought to the turbines may be readily imagined. Two steel pipes, with welded joints, descend from the valves to the power-station, diminishing gradually in diameter from the top to the bottom. At the top the internal diameter of each pipe is 4 ft 8 in; at the bottom it is 3 ft 3 in. To withstand the enormous and increasing internal pressure, the thickness of the steel of which the pipes have been fabricated increases from ⅜-in to 1¼-in, at a point about one-third of the way down. Beyond that the pipes are reinforced with steel rings at gradually diminishing intervals, until, at the bottom of the pipe-line, the strength of the pipes is equivalent to a thickness of 3⅛-in of solid steel. This increase in thickness from ⅜-in to an ultimate 3⅛-in of steel - more than eight times - gives some indication of the increase in the pressure of the water in its downward rush. Expressed technically, the water-power available at the power-station, if used to its fullest extent, is sufficient for the production of 13 kilowatts of electric power per litre of water per second, reaching the vast total of 133,250 kilowatts. The total weight of steel used in the fabrication of the pipe-line was no less than 14,800 tons. Provision is made in the Chandoline power-station for the establishment of five principal groups of turbo-alternators - four to be constantly in service and one as a stand-by - and one auxiliary set. For the present three of these groups have been installed. Two single-jet Pelton turbines arc used to drive each alternator; each turbine is of 21,250 horse-power, and each three-phase alternator, to which the turbines are coupled, has a nominal output of 30,000 kilowatts. Each alternator is flanked by a turbine on either side, all three being mounted on one shaft. AN IDEA OF THE SIZE of the Barberine Dam is obtained by comparing it with the small boat on the lake in this view. At the base the dam is 192 ft and at the apex 10 ft 6 in thick; it contains 269,000 cubic yards of masonry. The construction occupied five years, from 1920 to 1925, and the dam alone cost twenty million Swiss francs (about £800,000 at par). Innumerable Swiss firms, large and small, have co-operated in supplying all the necessary material for the carrying out of this great enterprise, and the majority of the engineers and technicians engaged were trained at the Lausanne School of Engineering. Both the barrage and the power-station, which, in its lay-out represents the last word in modern electrical development, reflect the greatest credit on all those concerned. But the Dixence scheme represents but one of many in the Alps on a scale almost equally great. The Chandoline power-station has only an indirect bearing on the working of the Swiss railways, but not far away to the west is found the Barberine dam and power-station, producing current which is exclusively for railway uses. It was in the year 1920 that construction work on the Barberine dam was begun, and five years elapsed before it was completed. 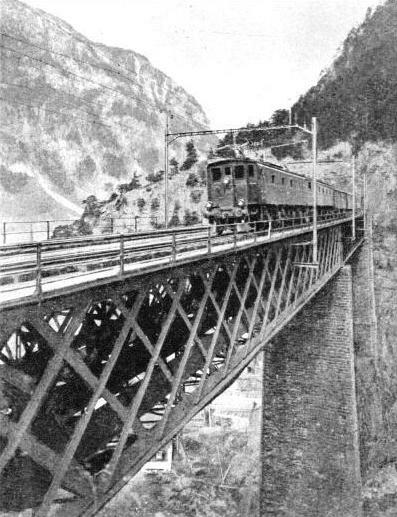 An electric railway which climbs out of the Rhone Valley at Vernayaz, to the southwest of Martigny, into the Trient Valley, up which it passes, with the aid of some remarkable feats of engineering, to the French frontier at Vallorcine. Here connexion is made with the narrow-gauge branch of the PLM Railway, which has come northwards from Chamonix. Just before the French frontier is reached, the trains of the Martigny-Châtelard Railway pass the great Barberine power-station. HIGH UP IN THE MOUNTAINS on the borders of Switzerland and France, is situated the great Barberine Dam, which has a maximum height of 256 ft, and a length, from one mountain wall to the other, of 935 ft. The volume of water thus imprisoned, at an altitude of 6,200 ft above sea-level, is 51 million cubic yards. From the take the water is conducted to the power-station at Châtelard. 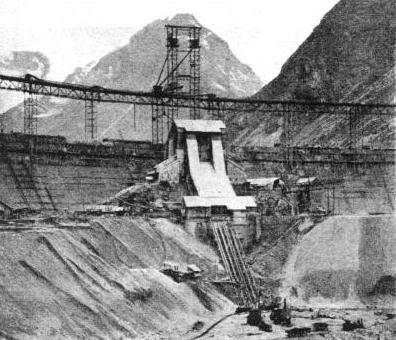 The dam required 50,000 tons of cement. Barberine Lake is situated up a wild mountain valley to the west of this point. The sightseer who desires to see this fine work of engineering takes a funicular railway which soars upwards from the side of the power-house, alongside the great pipe-line, to the upper level. This was originally built to carry up stone and other materials used in the construction of the barrage. It rises 2,200 ft and the steepest gradient is 87 per cent, or roughly 1 in 1⅛ - a somewhat nerve-racking experience for the nervous traveller. From the upper station a spectacular road has been driven, high up on the side of a sheer cliff - with magnificent views to the southwards of the whole mountain mass of Mont Blanc - and partly through tunnel, to reach the valley in which lies the dam. From the dam to the pipe-line the water is conducted in a tunnel through the mountains, as with the Dixence barrage. At a point where the valley narrows to a gorge, above the chalets of Emosson, the dam has been thrown across the valley. Containing in all 269,000 cubic yards of masonry and concrete, it is 192 ft thick at the base and 10 ft 6 in thick at the apex; its total length is 935 ft and its maximum height 256 ft. Fifty thousand tons of cement were. used in the construction of the dam, and six hundred men, for whom barracks were established at Barberine and Emosson, were employed. Work had to be suspended during each winter, because of climatic conditions at this altitude, and the beginning of operations in the spring consisted in the removal of anything from 15,000 to 130,000 cubic yards of snow from the works. Between the barrage and the head of the pipe-line, the rock through which the water is conducted is so hard that for a great part of its length no lining was necessary, and careful measurements have shown the entire absence of leakage. The fall of the pipe-line from the valves at the head into the power-station totals 2,360 ft, and the maximum thickness of the pipes at the lower end is two inches. 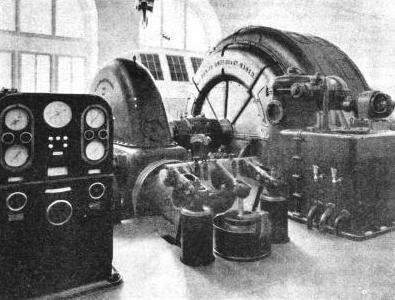 ONE OF THE FOUR HYDRO-ELECTRIC SETS at the Barberine power-station. In the centre is seen the Pelton-type turbine, of 16,400 horse-power, and on the right the generator, of 10,000 kVA capacity, producing current at 15,000 volts, 16⅔ cycles. In the power-station provision has been made for the installation of five groups of turbo-alternators, of which four are at present in use. Each set consists of one Pelton turbine of 16,400 horse-power, coupled to a generator of 10,000 kVA, producing current at 15,000 volts, 16⅔ cycles. The energy thus produced is transformed to a current of 66,000 volts, and is passed by overhead transmission to the associated power-station at Vernayaz, down in the Rhone Valley. The total cost of the Barberino scheme was roughly fifty million Swiss francs (approximately £2,000,000 at par), of which twenty million francs (£800,000) were expended on the barrage alone. 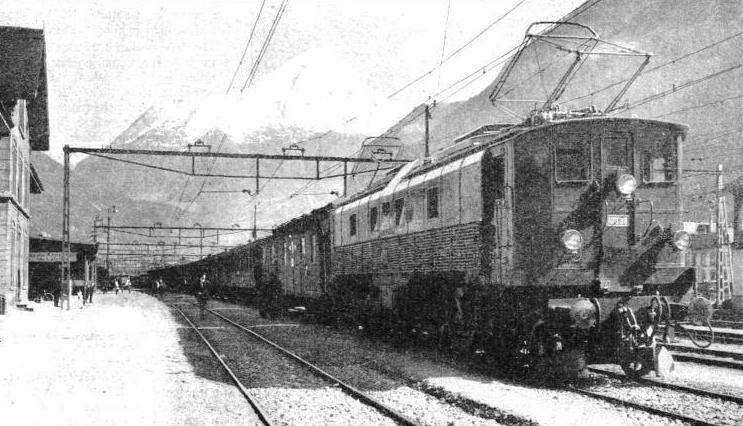 Sheltering under the precipitous south wall of the Rhone Valley, two miles from Martigny, is found the Vernayaz power-station of the Swiss Federal Railways, which, as just mentioned, is immediately linked with the Barberine station. Water for this station is collected from various valleys, including that of the Eau Noire, caught close to Châtelard, the Trient - including that which has already been made use of in the Barberine station - and the Triége, various small gathering basins having been established to ensure a regular supply. The fall on the pipe-line into the Vernavax power-station is 2,065 ft. Provision has been made at the station for six turbo-alternators, of which five sets are at present in use, four producing single-phase and one tri-phase current, the former generating power at 11,000 kVA, and the latter at 14,000 kVA In this way the Vernayaz station provides current both for the railways and for industrial purposes. Transformers are installed, capable of converting the current at will to a pressure of 66,000 or 132,000 volts, to provide for its distribution over long distances. LOOKING DOWN THE PIPE-LINE which, with a maximum gradient of 87 per cent (about 1 in 1⅛), carries the water from the level of the Barberine Lake down into the power-station. At the right-hand side of the pipes is seen the funicular railway which brought up the masonry and other materials to the upper level and has now been converted into a passenger-carrying line. The difference in level conquered by the funicular is 2,200 feet. From this station an overhead transmission line carrying the current at 132,000 volts passes on pylons down the Rhone Valley to the Lake of Geneva, then across the country north-eastwards into the Aar Valley, and on to Aarau, in the north of the country midway between Basle and Zurich. A total horse-power of 42,000 is developed in the Vernayaz station, and its capacity throughout the year corresponds to a total ot 250,000,000 kilowatt-hours. Altogether thirty-five million Swiss francs (£1,400,000 at par) were expended on the station and its associated works. The earliest power-stations in Switzerland designed to feed the railways alone were those on the St. Gothard main line, at Amsteg and Ritom. Both of these may be seen at fairly close quarters by the traveller in one of the St. Gothard trains. Amsteg serves the northern section of the route, up to the St. Gothard Tunnel, and Ritom the southern section, in the Canton of Ticino, from Airolo down to Bellinzona, Lugano, and Chiasso. The Ritom station is close to the station of Ambri-Piotta, five miles from the southern end of the tunnel. It utilizes the waters of Lake Ritom, which were raised in level by a small barrage, and contain thirty-four million cubic yards of water. CONTAINING 523,000 CUBIC YARDS OF CONCRETE faced with blocks of gneiss, the Dixence barrage is 230 ft thick at the base, and of its maximum is 280 ft high. The locomotive and cranes in the right foreground of this photograph give some idea of the immense scale on which the work is being carried out. On arriving high up above the eastern side of the Ticino Valley, the water is led to the pipe-line, which has a fall of 2,650 ft into the power-station, and which consists of two main pipes, bifurcating part of the way down into four pipes, of a total length of 4,560 ft. In the power-station are four turbo-alternating sets aggregating 60,000 horse-power, and producing current at 15,000 volts, which is transformed to 60,000 volts for long-distance distribution purposes. 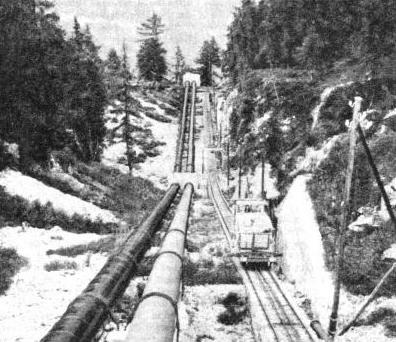 At the side of the pipe-line is the funicular railway that was used during construction to carry the materials to the upper level. Similarly to that at the Barbsrine station, the Ritom station line is now used to carry passengers up from Piotta to Piora. The Piotta-Piora line, with its maximum gradient of 88 per cent (1 in 1⅛), is the steepest passenger-carrying mountain railway in the Alps. A total of twenty-three million Swiss francs (920,000 at par) was spent on the Ritom power-station and its associated works. Amsteg station takes its water power from the rushing River Reuss. This has been dammed near the village of Pfaffensprüng, to make a basin having a capacity of 261,000 cubic yards of water, from which the water is led in a tunnel to a point opposite the village of Amsteg. From here the pipe-line comes for 900 ft. down the almost perpendicular eastern side of the valley. crossing over the St. Gothard main line on its way, into the power-station, which contains five groups of turbo-alternators producing single-phase current, and one group producing tri-phase current for industrial purposes. Together, these two stations on the St. Gothard line produce roughly 190,000,000 kilowatt-hours of energy per annum, and have a total combined horse-power of 34,000. In addition to the four main power-stations of Barberine, Vernayaz, Ritom and Amsteg, the Swiss Federal Railways draw current from four subsidiary hydro-electric stations. These are at Spiez, in the Bernese Oberland; at Mühieberg, near Berne; at Massaboden, near Brig; and at Küblis. in the Grisons. 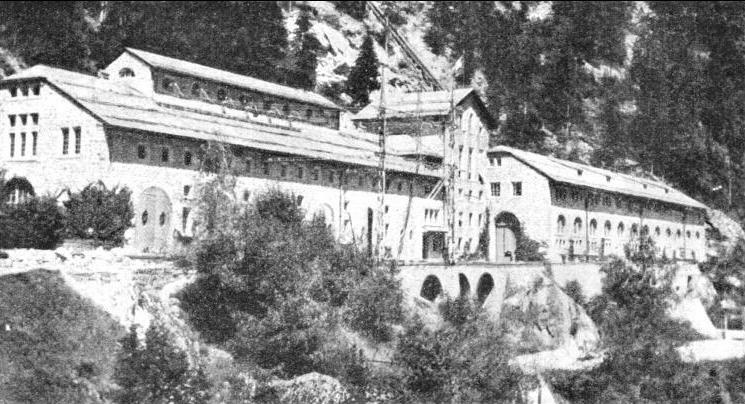 THE BARBERINE POWER-STATION is located in the deep Trient Valley in the south of Switzerland, at Châtelard, within two miles of the French frontier. Behind the station is seen the pipe-line, with a total fall of 2,360 ft from the upper level, carrying the water into the station to drive the turbines. Along the front of the station runs the electric railway from Martigny to Vallorcine. You can read more on “The Glacier Express”, “The Great St Gothard” and “Power for London’s Transport” on this website.